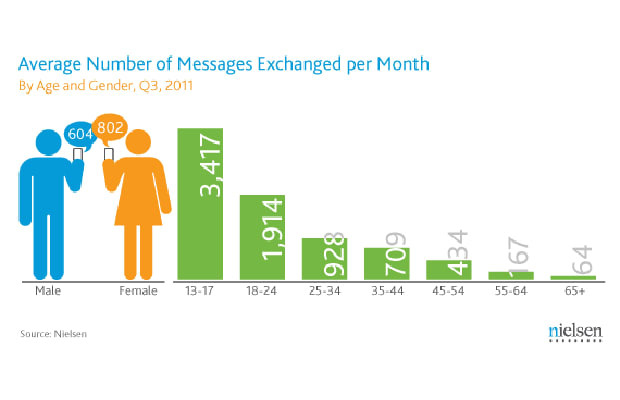 According to Nielsen (the same folks behind the questionable TV ratings system), the average teen ages 13-17 sent and received 3,417 SMS and MMS messages per month during Q3 2011, the equivalent of about 110 messages per day. Girls, in particular, kept that figure high, averaging about 3,952 messages while boys exchanged 2,815 messages. While teenage females were found to generally text more, males on average consumed more data—382 MB monthly versus 266 MB, an increase of about 256 percent from last year across both genders. As expected, voice usage was down across the board, as texting was deemed to be “faster,” “easier,” and “more fun” by the same focus groups.